Saint Mazie – loudlatinlaughing – Euge! Euge! Another great read from Jami Attenberg! This one tells the story of Mazie Phillips, a woman who spent most of her life in the “cage” in front of the movie theater she eventually owned in NYC, rescued at age 10 from abusive parents by her sister Rosie along with younger sister Janie. 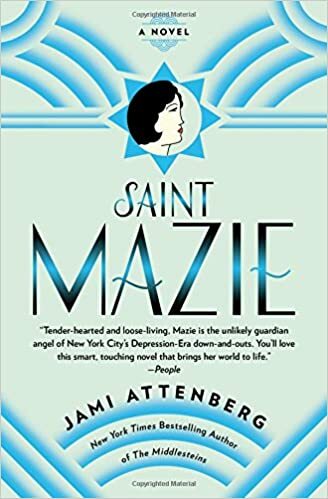 Mazie is adored in the neighborhood but loses her heart only a few times, once to a passing sailor (Captain Ben) who returns to town every year and they meet up, once to the nun Tee whom Mazie cares for as she dies of cancer. She’s well known as the Saint of the neighborhood for taking care of all the homeless and down on their luck people during the Depression. The story is told through snippets of her diary, interspersed with pages from her unpublished memoir, interviews with current Brooklyners and children of those in the story. Well done, an excellent choice for a taste of 1919-1939 NYC life.